Last night, I met up with Jenna and Treye in the downtown Des Moines area. A month ago, I photographed their proposal in West Des Moines. The next day they bought a house, and the following week, these two asked me to photograph their wedding. (I am sooo thrilled!) They’ll get married in Pella next June, and celebrate at Central College… and it’s going to be gorgeous! I’ve known Treye for years, but hadn’t met Jenna until the proposal. Seeing as I had spent about an hour (tops) with Jenna before their engagement photos, I wasn’t sure how quickly we’d get along. No idea why I was worried! We got to chatting immediately, and she and Treye showed me their true, fun selves. How can you know laugh along with them?! I love the following photo so much! One of my goals is to create genuine moments between my couples, and this is one for sure. I honestly think that I stepped back and was just taking photos when it happened! That, or squealing like a little girl because these two were rocking their session and we were like 10 minutes in. OHHHKAYYYY. Can’t handle these two!!! Also, pretty sure that wall matches both Treye and Jenna’s eyes. Totally not on purpose, but I’m not complaining! I’m trying a little moodier, grungy black and white edit these days. I kinda like it, to bring out the grit and emotion of some of these more romantic photos. Thoughts? Since y’all know I love nature and some green trees while they last, we headed out to a park near downtown Des Moines! I hadn’t been out there until the day of Treye & Jenna’s engagement session, but it was a sweet find. There’s a gorgeous fountain, hills and benches (perfect for a fall picnic!) and plenty of space to walk, run, and play. I’m thinking this will be a great space for fall family or engagement photos!!! Pinterest-perfect engagement photos, heck yes! 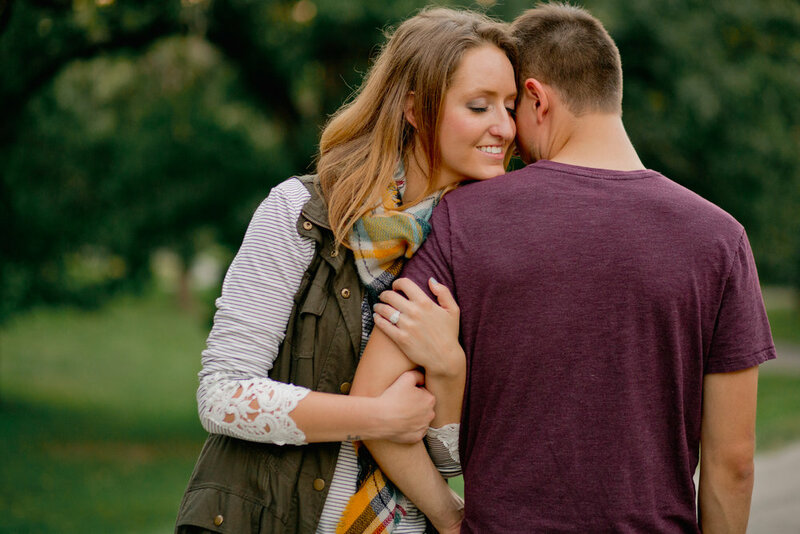 What is your favorite photo from Jenna & Treye’s engagement session?! I honestly am going to have a hard time picking, myself! Thanks for driving up to Des Moines from Pella, you two! I can’t wait to celebrate when you get married in Pella next summer! (And you know I’m going to be eating some stroop waffles… because you NOT buy Jaarsma when in Pella! !